We have just added a number of new sewing supplies and tools to the shop. Over the next few Tuesdays, I’ll be highlighting some of them in my Tool Tuesday series of blog posts. This week I’m going to start with my favorite thimble ever. I’ve been stitching since I was really little, but I didn’t start to use a thimble until two of my professors in design school insisted that we use them. Turns out, they really do make stitching easier and more comfortable! They prevent your finger from getting sore if you’re stitching with a heavy fabric, and they make it easier to grip the needle. I honestly think my stitching is better when I use a thimble, and it’s gotten to the point where I don’t like to stitch if I’m not wearing one. I keep one of these in my hand sewing kit at all times, and absolutely love it! When you use a thimble, wear it on the middle finger of your stitching hand and use it to push the needle through your fabric. It may feel awkward at first, but over time you’ll grow more comfortable with it and will see how useful it is. I’ve been using these Clover Protect and Grip thimbles for quite some time. They’re my absolute favorite, and I’m glad we’re able to offer them in the shop now. The colored part of the thimble is soft and flexible, so it contours to your finger. 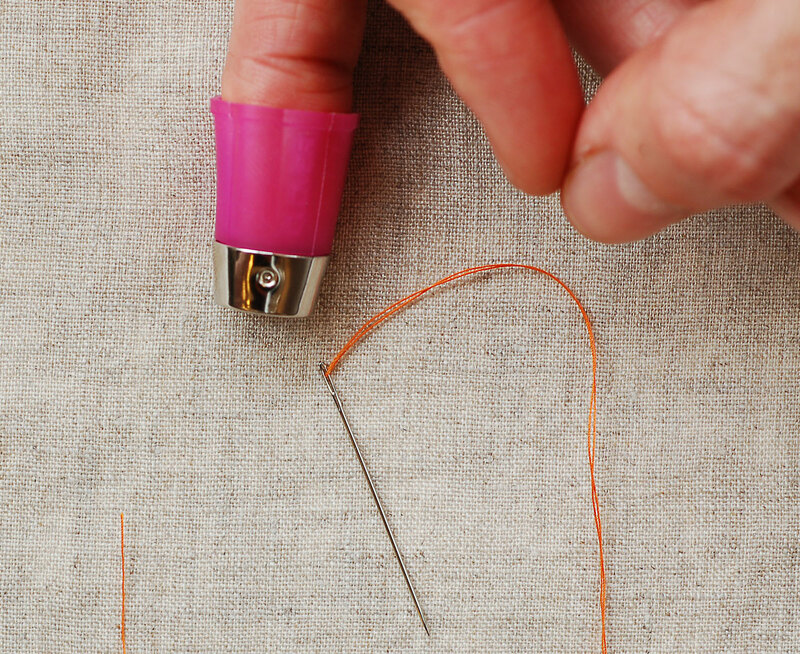 And if you reach a point where you really need to tug the needle through the fabric, the colored part of the thimble can also give you a little traction and help you to grip the slippery needle. 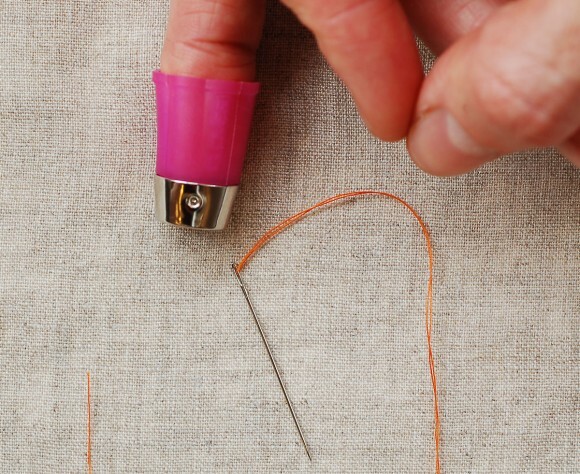 The metal cap protects your finger when you’re stitching and has little dimples that allow you to push your needle through even heavy fabrics really easily. It’s those little dimples that give you traction when you stitch, too. It’s also a really lightweight thimble, and the scallops around the edge let your finger breathe while you’re wearing it. This is become my favorite thimble, no question about it. I’m sure you’ll love it as much as I do if you give it a try. Lol today I was driving to my son and family for dinner and I was wearing my thimble!!! Finally found the Clover thimble. I have used a soft thimble for several years but this one fits my finger much better. I’m sure it will become my favorite, too.